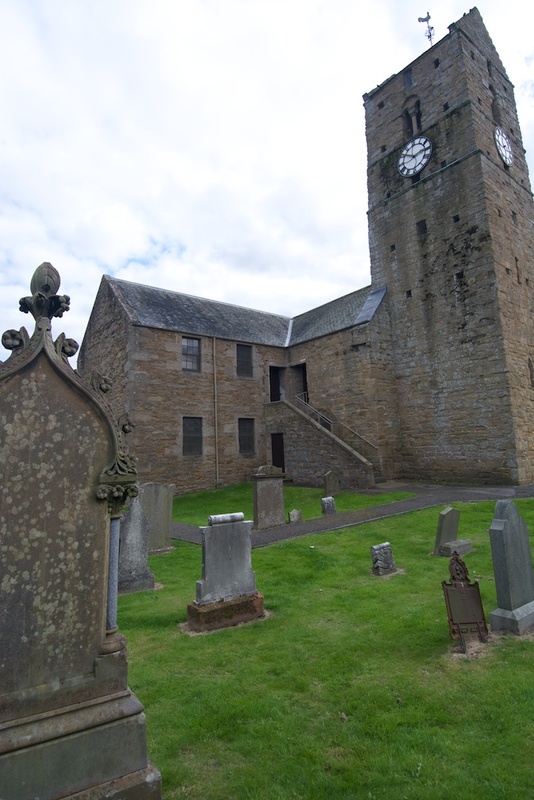 Standing at the centre of Dunning in Perthshire, the church of St Serf dates back to at least 1200; its lovely honey-coloured sandstone walls and Romanesque tower make it well worth a visit, and there are some interesting old grave stones in the churchyard. What makes St Serf’s church special, however, is a unique and breathtaking artefact that is preserved inside. When you open the door of most churches and turn towards the east, you expect to be facing the chancel, with the altar at the end. Not so at St Serf’s. Instead, you are presented with the sight of a magnificent carved stone cross, framed by an arch that it is as old as the church itself, and spotlit from above, giving the impression of some divine presence; in that first split second, the Dupplin Cross strikes you as if it had a life of its own. This is probably just how it appeared to the people whom it was designed to impress, over 1,200 years ago. 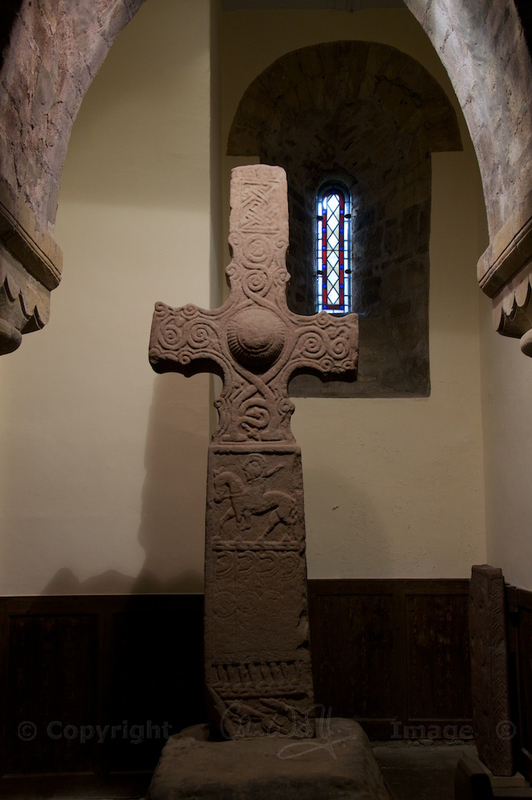 Described by Historic Scotland as “the only complete example of a free-standing cross to survive in Pictish territory”, it was made for King Constantine, a king of the Picts who reigned from around 789 to 820 AD. How do we know this? Incredibly, an inscription on the back of the cross has yielded the words ‘CUSTANTIN SON OF WUIRGUST’ (Causantin mac Fergusa, or Constantine son of Fergus). Looking at the place where the words appear, eroded almost smooth by centuries of weather, you are in awe of the skill and dedication of the historians who deciphered them. 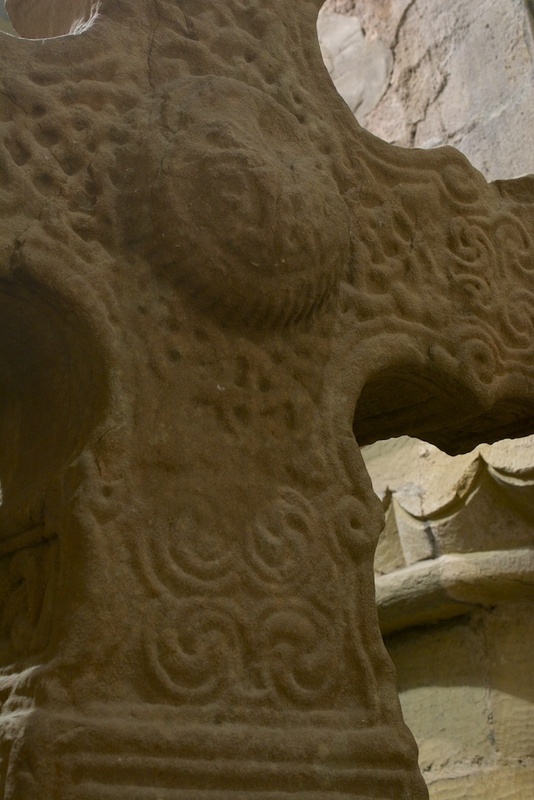 Considering the length of time that the Dupplin Cross has been exposed to the elements, we are lucky that any of its wonderful carvings have survived at all. Until 1999 it stood on a hillside about three miles from Dunning, at a place called Forteviot, the site of a Pictish king’s palace. What things it must have heard and witnessed. But back to the carvings… and they have plenty to say, if you take time to study them. In St Serf’s church, you are provided with useful menu boards which you can hold while you’re inspecting the cross at close range. In addition, there was a very helpful and knowledgeable guide on hand, who had issued forth like a benevolent guardian of the cross from his ‘HQ’, a small stone building just within the gates of the churchyard. For me, the most arresting feature of the Dupplin Cross is the large domed boss in the centre. There is a similar dome on the other side, but it is even more weathered (possibly from facing the prevailing winds). Having asked the guide his opinion about it, he told us that historians believe it may represent the sun, and he pointed out that it is very slightly tilted – sitting not at right angles to the surface, but angled just perceptibly upwards – which is doubly intriguing. It’s almost as if someone has shaken out a blancmange (as I’m sure the Picts were wont to do) and one side of it has partly subsided. I’m fascinated to know why the middle of this boss is so plain, when the rest of the cross has almost every surface decorated in patterns, images and symbols. This is the focal point, the crux of it all. And what is with the curious ribbing around the edges, and the inner circle that looks like piping? I’m guessing that there was a carving in the centre, which has now been lost. I wonder if this was exacerbated by constant touching – maybe it was considered good luck to touch that part of the cross? It also struck me that the dome is reminiscent of a hill fort, and I wondered if it was meant to represent the hill where the king had his palace. And this, in turn, led me to wonder if the cross was ever painted (and why not – they were Picts, after all?) I should emphasise that I am not a historian, and these speculations are mine alone. I would welcome your thoughts! Spiralling and intertwining stems run riot along the arms, enclosing the dome feature as if for protection. The sign board suggests these are vine tendrils, inspired by Northumbrian art, and evoking the wine used in the Eucharist. Underneath is a horseman, whose over-sized head and moustache are meant to convey his status and authority. Is that an arm thrown out behind him, or a flying scarf, or his ponytail? Picts, you have left too many questions unanswered. Below him are four tightly-packed warriors bearing shields, and at their feet is a party of hunting dogs. It’s all beginning to look like a graphic novel. Two more warriors and their ornate moustaches are squeezed into a side panel, while on the back is a scene with a man (the sign says there are two men, but one looks more animal-like) apparently slaying wild beasts. Round to the other narrow side, and there’s a ‘snapshot’ of a big-headed figure (possibly Constantine again) playing the harp. 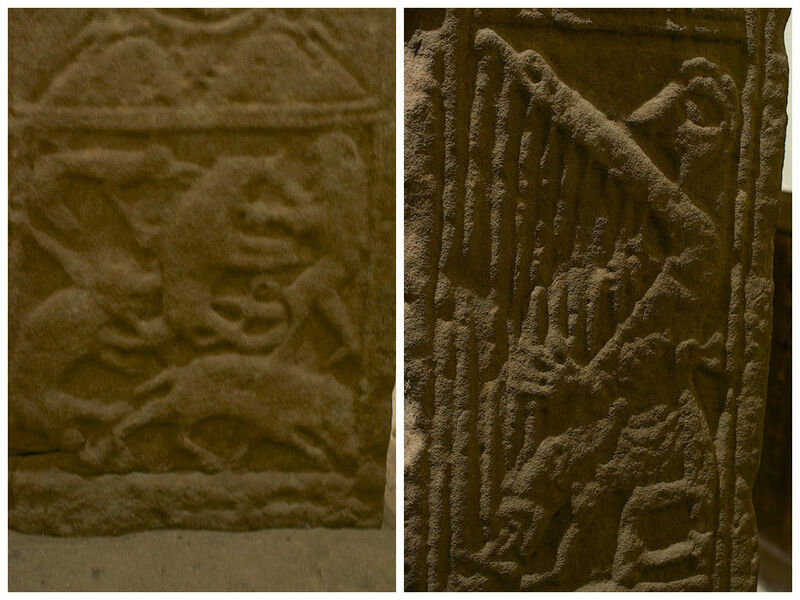 Left: a figure (or figures) slaying wild animals; right: a man, maybe the king, playing a harp. So what can we conclude from the images? That Constantine was a brave warrior, and commanded a fierce, well trained army; he was a skilled horseman and huntsman, and a fearless protector of his people; he liked a spot of harp music; and he was keen to connect himself – both spiritually and in the minds of his people – with the new-found faith of Christianity. Perhaps with this cross he intended to secure eternal salvation for his soul, while having a good time doing so. 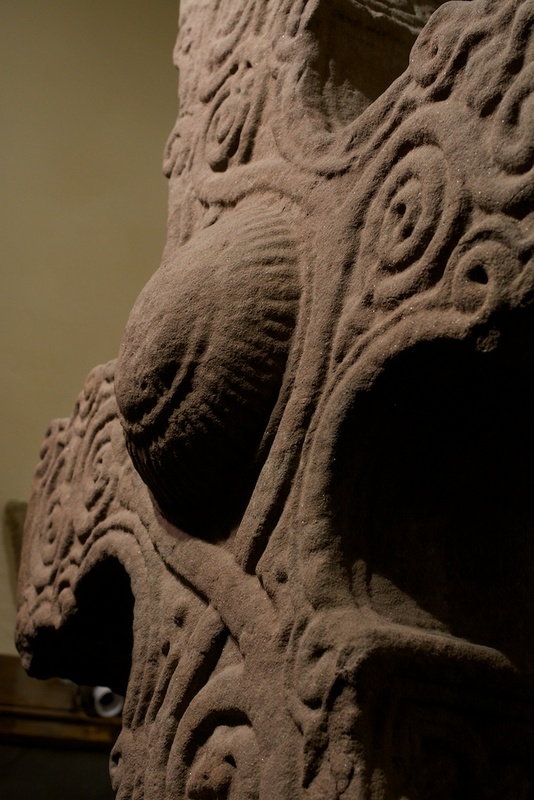 As for the inspiration behind the shape and pattern, the sign boards explain that “Iona is the likely source for the double-curved arm”, while the tightly wound spirals and symmetrical ‘fountain’ shapes, seen elsewhere on Pictish stones, now serve as decoration for a blatant show of power. Blending the figurative and the abstract, it seems to me that the cross bears the last remaining hints of a pagan wisdom that was fading into the twilight. 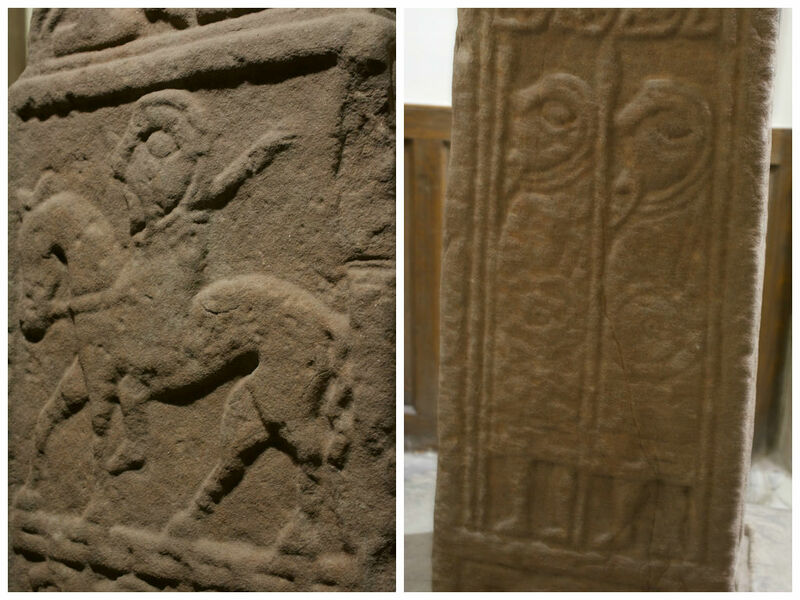 If the Dupplin Cross was created and set up in the early years of the 9th century, it wasn’t long before the downfall of the Pictish royal dynasty that it celebrated. It’s believed that, in a battle fought in 839 AD, at an unknown location but perhaps somewhere in what is now Perthshire, the Vikings wiped out the kings of both the Picts and the Scots, allowing the rise of a new royal line that would bind the Picts and Scots together as one. If ever there was a case of uncanny foresight, this is surely it! Perhaps Constantine wanted to bequeath a photo album of his ‘best moments’ to history. 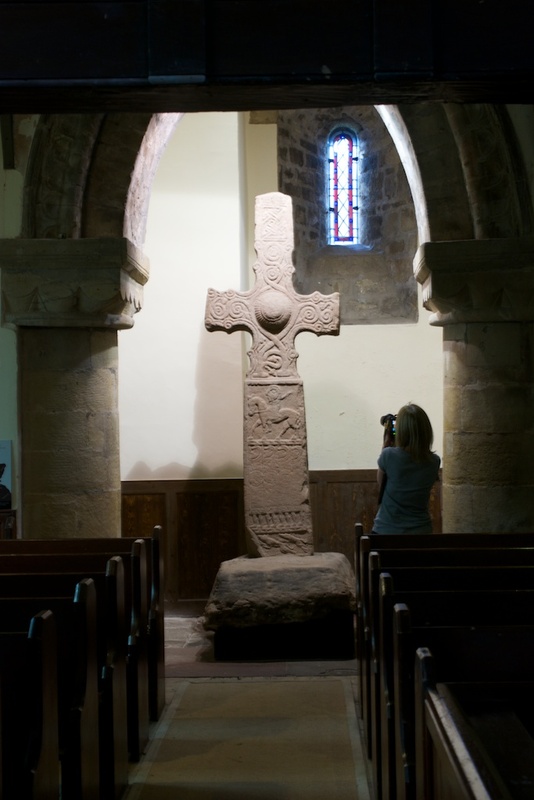 Hewn from local Old Red Sandstone, the Dupplin Cross stands over eight feet six inches tall and measures three feet across the arms. Historic Scotland says: “Free-standing crosses were more commonly erected in Ireland, western Scotland and Northumbria than in eastern Scotland. 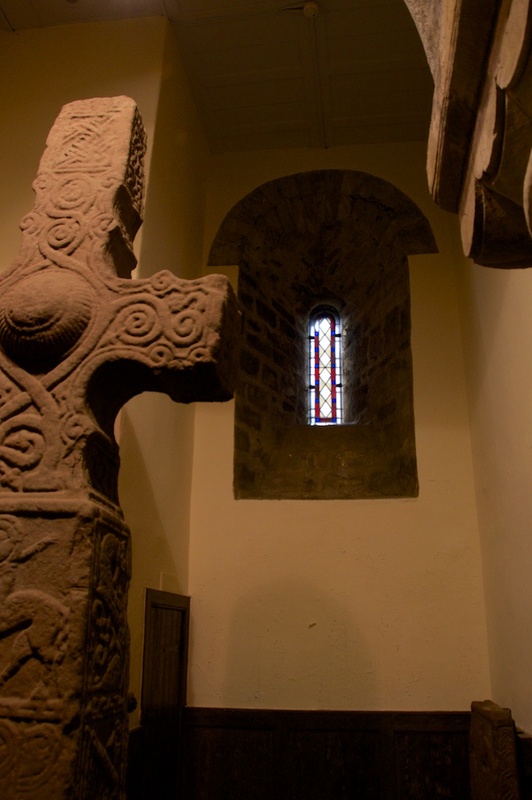 In fact, the Dupplin Cross is the only complete example to survive in Pictish territory. It is quite possible that there has been a church here since early Christian times, because the site has a connection with St Serf, a 6th century missionary who founded a priory on St Serf’s Inch in Loch Leven and is reputed to have slain a dragon at Dunning. There are echoes of St Fillan here, perhaps. Over the centuries, the church has received quite a few additions. The original rectangular structure consisted of a nave and a square chancel, with a tower above. In the late 16th century, the Reformation abolished all kinds of symbolism and adornment within churches, and it was decreed that everyone should be facing the preacher rather than the altar; this seating arrangement is still preserved in St Serf’s today. In the early 1800s a large aisle was added to the north side and galleries were built above, in order to house the increasing numbers of worshippers. The village of Dunning is about 8 miles south-west of Perth, on the edge of the Ochil Hills. 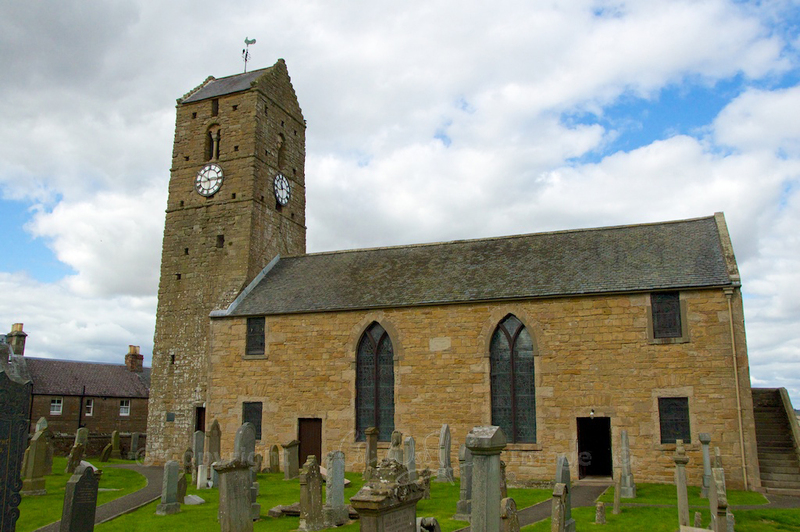 St Serf’s Church is in the care of Historic Scotland, and is open from April to September (9.30 to 5.30 pm). Admission is free. If you’re as intrigued as I am by the puzzles that the Picts left behind, take a look at the stones at Aberlemno and Fowlis Wester. Really enjoyed reading this, and the pictures – would love to visit and see the cross in real life. Beautiful, enigmatic carvings. Found your comments on the domed central boss very interesting. Thanks for the article! Thank you very much! 🙂 Really glad you enjoyed it. Yes, the carvings really make you sit back and wonder, both at the artwork and the meaning (and the moustaches!) I’ve been meaning to go and see it for ages, but you need to make a special journey because it’s not really on the way to anywhere – well worth it, though! Thank you for your fascinating exposition – I like your thoughts and find them convincing. Happy to hear this, Viv! Thank you. Thank you, Lynne! Yes, the cross is just amazing. The church is interesting too, with some beautiful stained glass windows by Bannatyne or Ballantine (I think!) I recognised the style from some of your own posts.